A Chinese sports delegation featuring Chinese Basketball Association President Yao Ming arrived in North Korea on Monday for a goodwill visit, with Chinese experts saying on Tuesday that the move will further deepen the friendship between the two countries' peoples. The delegation, composed of China's men's and women's basketball teams, was led by Gou Zhongwen, head of General Administration of Sport of China, the Korean Central News Agency reported on Tuesday. 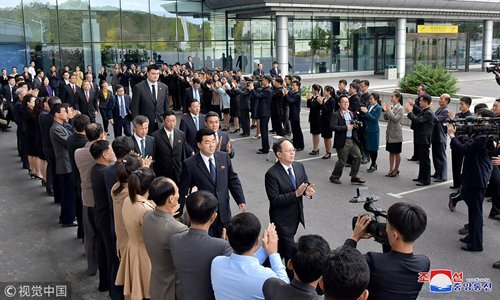 They were "warmly welcomed" by North Korean officials, including the country's Minister of Physical Culture and Sports Kim Il-guk, at Pyongyang International Airport on Monday, according to the report. The Xinhua News Agency reported on Friday that the visit was made possible by the North Korean Minister of Physical Culture and Sports. The Chinese basketball teams will play exhibition games with their North Korean counterparts during the trip, Xinhua said. Chinese analysts said the sports delegation sent to North Korea is the most prominent one in recent years and is a part of North Korea's "basketball diplomacy." Lü Chao, a research fellow at the Liaoning Academy of Social Sciences, told the Global Times on Tuesday that sending such a high-profile Chinese delegation shows the rapid and positive development in bilateral ties. The visit, at a time when China-North Korea friendly relations are developing on a new high stage, will contribute to strengthening exchanges and cooperation in sports and deepen fraternal ties between the peoples of the two countries, the Korean Central News Agency said on Tuesday. Zheng Jiyong, director of the Center for Korean Studies at Fudan University in Shanghai, told the Global Times on Tuesday that sports is a good way for the two countries to communicate as North Korea continues to face UN Security Council sanctions and the country's ability to cooperate in other fields remain limited. "Many people may see sports between countries as regular activities. But when it comes to North Korea, the country sees such activities as a significant development in diplomatic ties," Zheng noted. The sports delegation's visit is expected to usher in a series of more important diplomatic events between China and North Korea, Lü said. This is not the first time that China has sent basketball teams to North Korea. In May 2016, The Chinese men's Olympic basketball team visited North Korea and played three exhibition games with a North Korean team, with North Korean leader Kim Jong-un in attendance, according to a statement the Chinese Embassy in North Korea released in May 2016. "Kim Jong-un himself is a basketball enthusiast, and the sport is becoming increasingly popular among North Koreans too," Zheng said. Yao is not only the president of the Chinese Basketball Association but also a former NBA star. "Yao is a star among North Koreans … His presence in the delegation is likely to become a hit in North Korea," Lü said. Yao's presence will help boost ties between China and North Korea, Lü noted. Another former NBA star, Dennis Rodman, has "made a not-so-quiet impact" on US-North Korea relations since 2013 by traveling to the country several times and meeting Kim Jong-un, calling Kim Jong-un his "friend for life" and a "great guy," the Washington Post reported in June. Although Yao and Rodman are helping develop ties with North Korea, Yao will achieve more significant results, Lü predicted. Rodman visited North Korea on his own behalf, but Yao is visiting as part of an official Chinese sports delegation, Lü noted.